RS485 Sniffer is a system utility to collect data that goes through COM ports of your PC. Essentially, this RS485 communication software performs the following functions – monitors and records data exchanged with a serial port so you can use it for further analysis and, if required, trouble-shooting. This is of critical importance for development and testing of applications, drivers and serial devices. This RS485 monitor software has a number of additional features, including advanced filtering and search, terminal mode and options to export data in various formats. Clean interface and intuitive navigation make RS485 Sniffer extremely easy-to-use. You can connect to a serial port anytime – even if there is a device connected to it -and start collecting and displaying IOCTLs (input/ output control codes) instantaneously. Capability of this RS485 data logger to capture full information in the real time mode makes it possible to identify and correct problems on time. This RS485 analyzer makes it possible to watch multiple ports at a time, i.e. you can intercept data on interaction of application with multiple ports and devices. All of this is done within one session, the output – a single log where data is arranged on a first-in-first-out basis – is easy to analyze. Information can be redirected and recorded in a specified folder. You can also copy it to a clipboard to paste it wherever you need to. RS485 protocol analyzer enables saving monitoring sessions so you can get back to them when required. There are 4 modes – table, line, dump and terminal – you can choose from when browsing data. Each suits a particular purpose. RS485 Sniffer offers convenient filtering options so you can view only relevant parameters without being distracted by excess information. To check a reaction of a monitored device to a particular command or data, it might be required to simulate sending data to a serial port. RS422 Monitor allows you to do that, formats supported include string, binary, octal, decimal, hexadecimal, mixed. RS485 Sniffer allows to view and analyze communication data sent via Modbus ASCII and RTU protocols. With this RS485 communication software you will be able to monitor and analyze the activity of serial devices. RS485 Port Sniffer offers a special session playback possibility - you can send information got from the application to the RS485 port once more. It means that you can resend data received from the app to the serial port. This allows reviewing port's behavior on receipt of the same data for as many times as needed. Sessions can be compared with the possibility to automatically display the differences between them. Support to all types of serial ports - standard on-board ports, extension board ports, software-based virtual COM ports, bluetooth serial ports, USB to SERIAL cradles, etc. Whether you're looking at redistributing our Serial Port Monitor technology as a part of your product or considering Serial Port Monitor software for an enterprise-wide deployment, we offer flexible and affordable corporate solutions designed to meet your needs. Ordering Source Code license for Serial Port Monitor you receive all extensively commented programming source code (GUI sources are not included). Our leading developers will help you implement Source codes and understand the advanced part of the product. Unlimited Site License grants you the right to install and utilize Serial Port Monitor application with GUI on unlimited number of computers by all workers of your company worldwide. It is the ideal solution if your company has representation offices in the different parts of the world. If you know the certain number of computers to be equipped with Serial Port Monitor you may consider obtaining Limited Site License. The advantage of Site Licensing comparing to multiple Single licenses is one license key for all company computers. 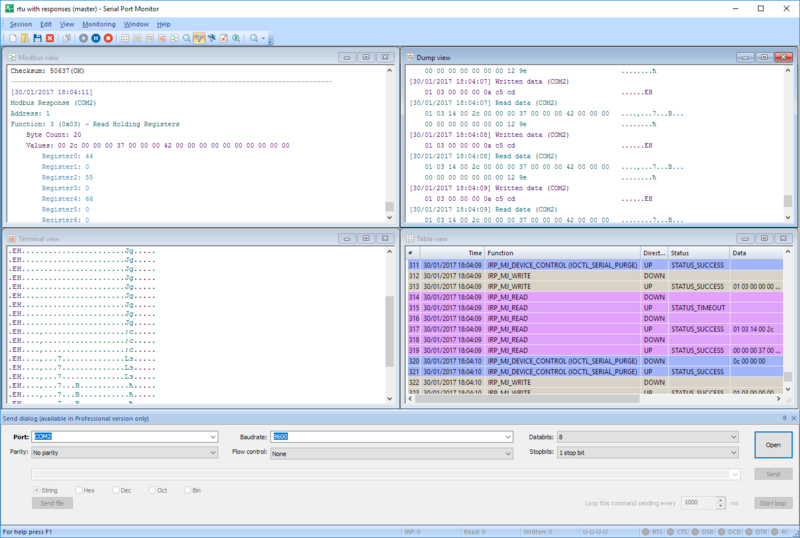 With Serial Port Monitor by Eltima Software I have easily managed to develop a useful tool for logging and debugging and even embedded it into my own software. Serial Port Monitor allowed the analysis which would be impossible any other way. I was using your product to investigate the protocol which PC software uses to communicate with a mobile phone so I could get my SMS control device to do the same thing.